Through extensive research, I learned that nets can prevent sharks from entering designated beach areas, but also cause sharks and other marine life to get entangled. Though Dr. O’Connell’s barrier aimed to prevent marine animals from getting caught and testing thus far was successful in deterring sharks, there were many concepts and environmental elements his barrier did not consider. I developed an interest in the Ampullae of Lorenzini, the “Natural GPS System” of sharks and stingrays, which allows the creatures to utilize the earth’s magnetic core to navigate large distances and find prey. Contemplating Dr. O’Connell’s barrier theory that magnets would deter sharks, I joined the FLVS Science Fair Club to put this theory to the test. For this experiment, I was going to place magnets in the water with sharks and stingrays during daily feedings to determine whether they would be repelled by different strength magnets. It was tough at first, being a 12-year-old girl with an idea to put magnets in a tank full of sharks. But in September 2016, after a couple of meetings and a tour of the facility at the Florida Aquarium, I finally had a place to do my experiment on bonnethead sharks and southern stingrays. The Florida Aquarium has a back area where they keep animals they have received from other aquariums or that have been rescued from different locations. Unfortunately, shortly before the first experiment was to be conducted, the facility encountered an issue with the water system and the sharks and stingrays from my experiment were transferred to Kentucky. Though I was unable to complete the experiment myself, there were people who completed similar experiments and had the answers I needed. I reached out to Dr. Stephen Kajiura who runs the Elasmobranch Research Laboratory and leads research at Florida Atlantic University. He was quick to return my call and over a period of time, we had multiple phone discussions. Through my research, I discovered that sharks were indeed deterred by magnets. I decided that I was going to build a netless and pipeless shark deterrent barrier, one that would safely deter sharks and stingrays from designated beach areas. Yet again, I was left with the situation of being a young girl with a large idea attempting to find supporters. At this point, I took a break from the demanding shark project to participate in the FLVS Model United Nations Club (MUN), which opened another door for me. 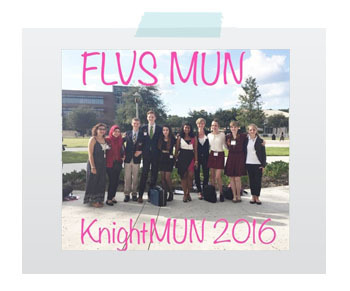 MUN has helped me develop a broader understanding and political interest in the modern-day world. An important lesson I learned from Model United Nations is that there is always a bigger picture. There are always problems that are bigger than what I or any other individual may be dealing with…refugee crisis, peacekeeping, civil wars, starvation, terrorism threats, and globalization are some issues faced by entire countries, regions, and continents. The experience and knowledge I gained after my first MUN conference gave me an optimistic outlook on my project. I was positive that if I could come up with solutions to deal with the problem I had just faced in my committee, I could find someone who would support my shark project with perseverance. At this point, I began reaching out to universities and others to find supporters. In 2016, I reached out to individuals at the Florida Institute of Technology and USF, including the Chair of Biomedical Engineering. Even though I encountered a few setbacks, the project really took off when I found grants and funding for my barrier with USF. Mr. Andy Casagrande, the Emmy award-winning cinematographer that films Shark Week, also contacted me after he heard talk of my project. He has been and continues to be a supporter of my shark project. 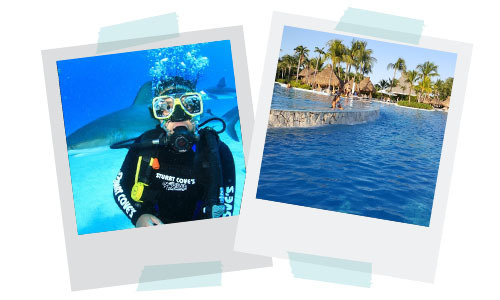 When I realized I needed to complete my scuba certification to test the shark barrier, Mr. Cassagrande introduced me to Stuart Cove’s Dive Bahamas where I completed my certification and became familiar with the sharks at their facility. 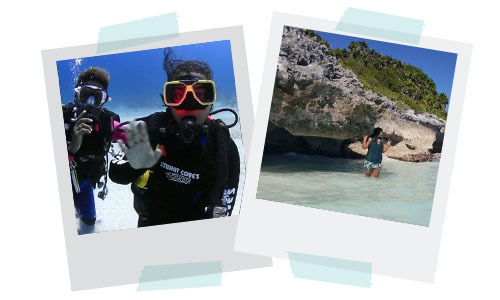 During my week in Nassau, I had a few “once in a lifetime” experiences. I did seven dives in the most beautiful reefs and wrecks, swam through large schools of colorful fish, dislocated my shoulder on a dive in the middle of the ocean, and completed my scuba certification. I had the opportunity to swim through the underwater James Bond plane and shipwrecks seen in the films “Never Say Never Again” and “Thunderball.” We swam over giant schools of parrotfish and observed parts of an intricate coral nursery created by my dive instructor and the Reef Rescue Network to rehabilitate sick and damaged coral reefs in Nassau. One of my favorite moments was the last dive, just before my shark dive. I saw blue tangs, barracuda, different species of parrot fish, and my first Arrow Crab (a very small, spider-like crab with tiny blue bioluminescent claws). As we started to descend to a depth of 40 feet, a large school of blue tangs swam past everyone else and came straight to me due to my iridescent nail polish. After my dive with the blue tangs, I completed my shark dive with 16-foot+ sharks at a depth of 45 feet. Aside from myself, there were only professional dive instructors participating. I was the youngest person present about to dive in a shark feeding frenzy! Upon our descent, there were a few scattered nurse sharks, but when the bait box broke the waves, there were about 20 to 35 Caribbean reef sharks and nurse sharks swimming around us within seconds – all much more observant and less aggressive then I had expected. One of my goals is to diminish the media influenced fear of sharks (caused by movies like Jaws that sensationalize dangerous sharks). I am also currently working with another One Ocean Global Ambassador on an inspirational video project with a National Geographic cinematographer to prove that sharks aren’t what the media makes them out to be. Currently USF Biomedical Engineering is helping me create my netless and pipeless shark deterrent barrier. The professor I work with has gotten me a volunteer position at the University, where I can be present and learn while my barrier is being engineered (and have access to the university library and online materials). When ready, we will be doing controlled testing at the Florida Aquarium’s back facility that is now back up and running. Our open water testing will be done with Deep Obsessions here in Florida and at Stuart Cove’s Dive Bahamas site. Plans beyond the completion of the barrier include filming with Shark Week and working with local and international authorities to set up my barrier around beaches worldwide to prevent loss of life – human and marine. On the extracurricular side of things, I will continue to participate in MUN throughout my high school (and university) career. Aside from marine biology, politics, and debate, my true passion lies in the medical field. I plan on going to medical school and specializing in cardiology. Most recently, I was asked to participate in the Great American Teach-in at a local school. Through my ambassador position at One Ocean Global, I was sent hundreds of shark and stingray stickers and wristbands to give away. While I had these gifts to give students as a reminder of sharks after the presentation, I also had the task of telling them my story to inspire them to “widen their world.” The presentation was a success and many were inspired to take part in bigger projects in addition to their schoolwork. This was not only a learning experience for the students, but for me as well. Most of time when I tell my story I omit the hardships. When I told my story this time, I spoke of all the hardships, setbacks, and how I had to persevere. I came to find that I inspired these students by acknowledging my successes and hardships. I told the students that there will always be challenges throughout the entire journey, but with perseverance, the outcome will be worth it. One of the students told me that by sharing my hardships, it showed that I was human. One of my favorite quotes is “A journey of a thousand miles begins with a single step” from the Chinese proverb Lao Tzu. Florida Virtual School was the first step on my journey of a thousand miles. It opened the doors to many opportunities for me when I was going through the hardest of times. Unlike at a brick-and-mortar school, at FLVS you’re not limited to the courses within your grade level. If you are a sophomore and you’ve already completed 10th grade science, you can move on to 11th grade science without being restricted. The beauty of FLVS is that it allows me to take all the classes I need to be successful, and the flexibility for me to complete my schoolwork throughout my busy schedule. FLVS has honestly made a huge impact on my life. The independence and organizational skills I’ve acquired, as well as the ability to choose from a vast number of attention-grabbing courses, has made FLVS my best schooling experience so far, and I would honestly recommend FLVS to everybody. Sierra Boodhoo is a One Ocean Global ambassador, a Conversation Ocean ambassador, a Fin Alliance ambassador, inventor of a shark deterrent barrier, and Model United Nations delegate. “Along with all these things, I am still a student, a sister, a daughter, a granddaughter, and most importantly, a learner and a teacher.” Interested in ocean conservation? Join her at an upcoming beach cleanup event! Contact her at SierraSharkQueen@gmail.com or follow her on Instagram. This entry was posted in Homeschool Edition, Student Edition and tagged FLVS Clubs, FLVS Science Club, Marine Biology, Model United Nations, MUN, Shark Week, STEM, Student Ambassadors, Student Spotlights, Student Success, Students in STEM on July 27, 2018 by Guest Blogger. You are truly remarkable Sierra! Thank you for sharing both your successes and your hardships. I’m so inspired by your growth, determination and perserverance! Thank you for persisting no matter what. Best of luck in all you do in the future.